It is rare that an artist's work is so original in style and so immediately recognizable that it actually evolves into a genre of its own. Such is the case with Terry Redlin, whose heartwarming scenes have been gracing art lovers' walls for over three decades. Beginning with the 1977 release of "Winter Snows," Terry Redlin enthusiasts have collected over 2 million art prints and an even greater number of collectibles and home decor products. Over the course of his career, Redlin’s style evolved from the wildlife scenes of the early years to the glowing cabins in the woods to children flying kites. Every image comes to life with Redlin’s magical ability to create a glow from within his paintings. His style, referred to as “romantic realism,” is not intended to be photographic but rather a compilation of places he has been, people he has known, and memories he has shared throughout his lifetime. 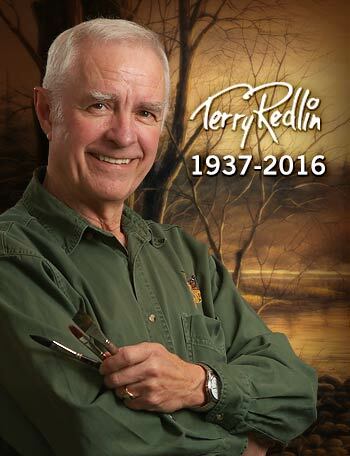 In 2007, after a lifetime of artistic achievements, Terry Redlin announced his retirement from painting and print signing due to his struggle with dementia. Redlin, who was widely known as "America's Most Popular Artist," had accomplished what he set out to do. "I wanted to tell stories with my paintings, to remember the experiences of my youth, and capture forever events related to me by older folks I had the pleasure of knowing," said Redlin. "America's rural past, in my eyes, was a wonderful place full of both beauty and opportunity. How fortunate I've been to spend my life creating memories of those distant times for others to enjoy." Terry Redlin passed away on April 24, 2016 at the age of 78.